My walls are starting to get pretty full with all of the projects I’ve been doing. So of course I have yet another one for you! 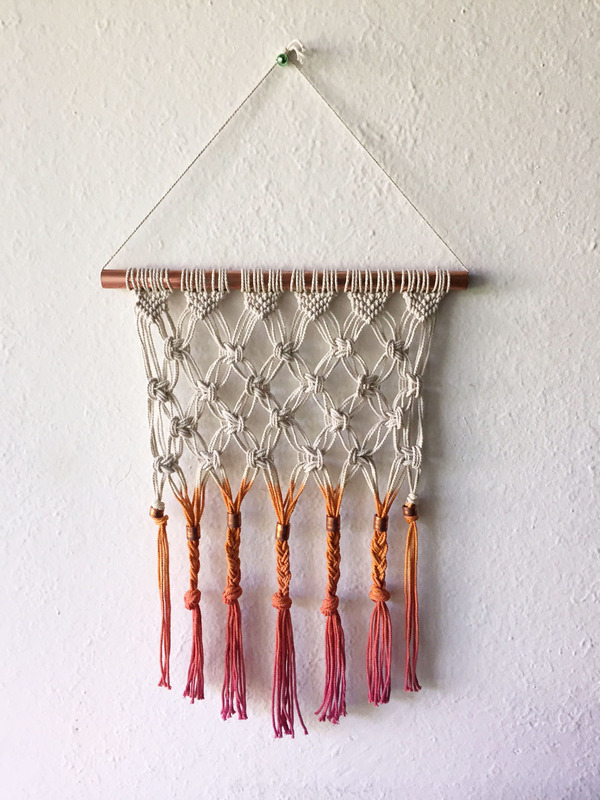 I love the look of the macrame wall hangings so I decided to make my own! And of course copper plays a small role in this DIY, it was inevitable. 1. 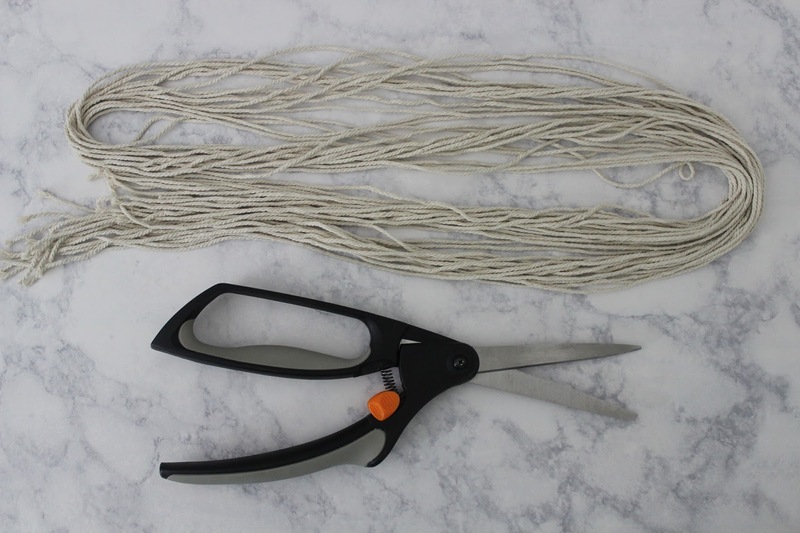 Cut 30 pieces of 70″ cord. 2. 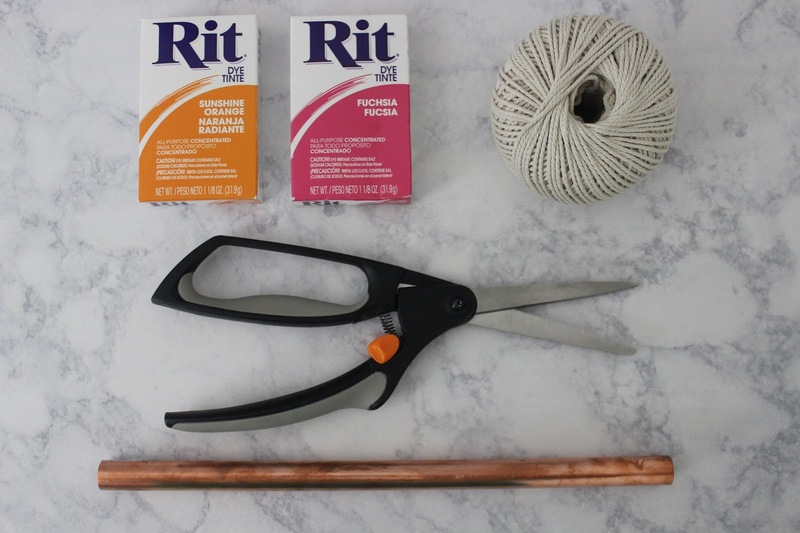 Attach cord to copper pipe. 3. Separate the strands into groups of 5. 4. First part is like making a bunch of friendship bracelets. Take the left strand and create a “4” over the strand next to it. Wrap the left strand under the right and pull through to tighten. 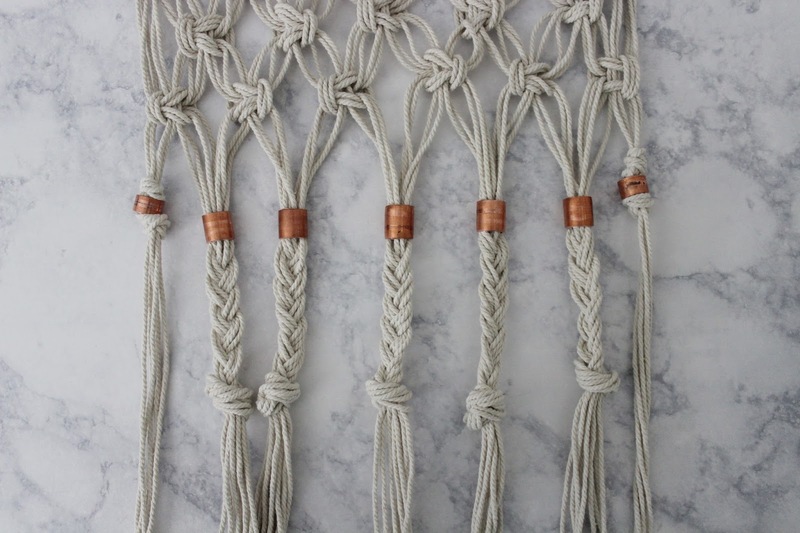 Do the same wrap around each strand twice. You will wrap from the left to right over 4 strands, then start on the right and wrap towards the left. When you wrap on the right you do everything the same only with a backwards “4”. When you get to the center you can wrap either left or right. 5. Repeat the same wrapping to create 3 rows. 6. 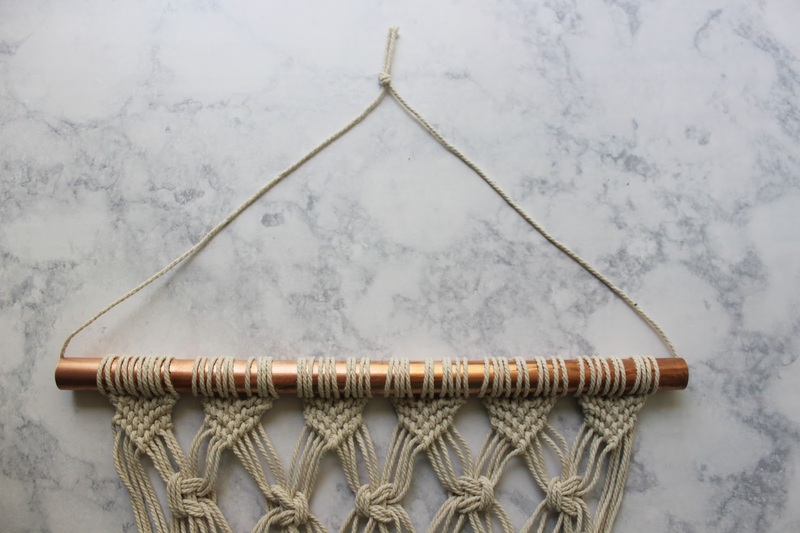 Now for the macrame! Separate the strands so the far left and right 5 strands aren’t used. 7. Separate the strands into 3 groups, 3 – 4 – 3. Take the left 3 and wrap over the middle and through the opening between the middle and right. The right 3 wrap under the middle and over the left. Do the exact same steps only the left goes under and the right goes over. Tighten and move to the next section. You can do the same exact wrap for each section or switch it up and do every other one different, left on top first or right on top first. 8. 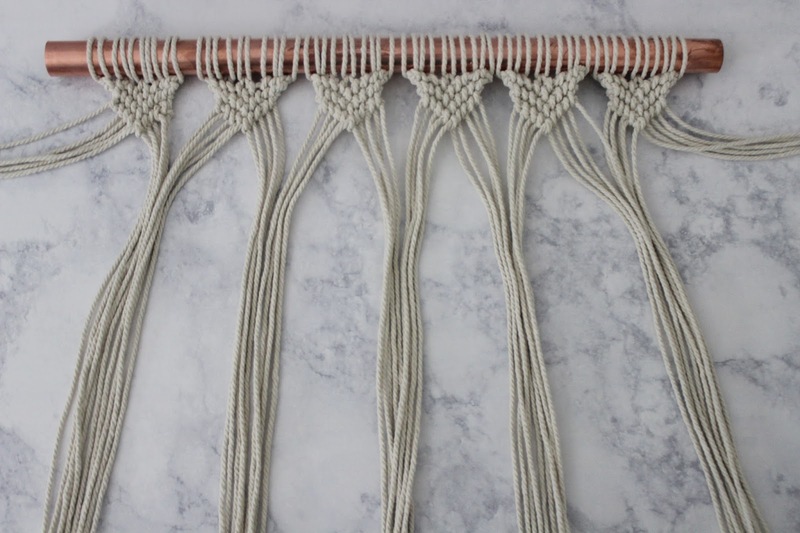 Once you finish the first row, add the furthest strands you left out into the mix and create a few more rows. Go crazy and make it as long as you want! I finished off mine with extra copper pieces, knots and braids. 9. Follow the dye instructions and create an ombre dye. I used RIT dye and dipped the cord in orange and then the pink. Let it dry overnight, then clean up the ends by snipping off the uneven strands. 10. 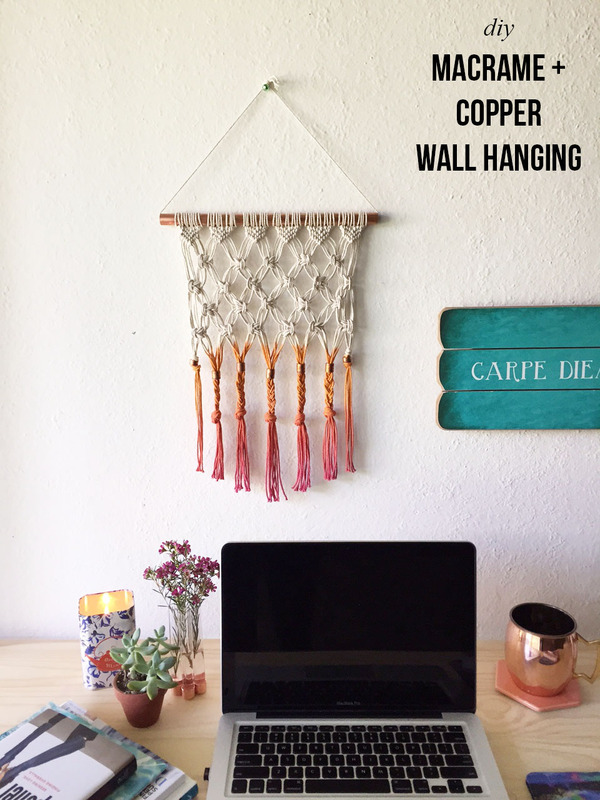 Run cord through the copper pipe and hang anywhere! 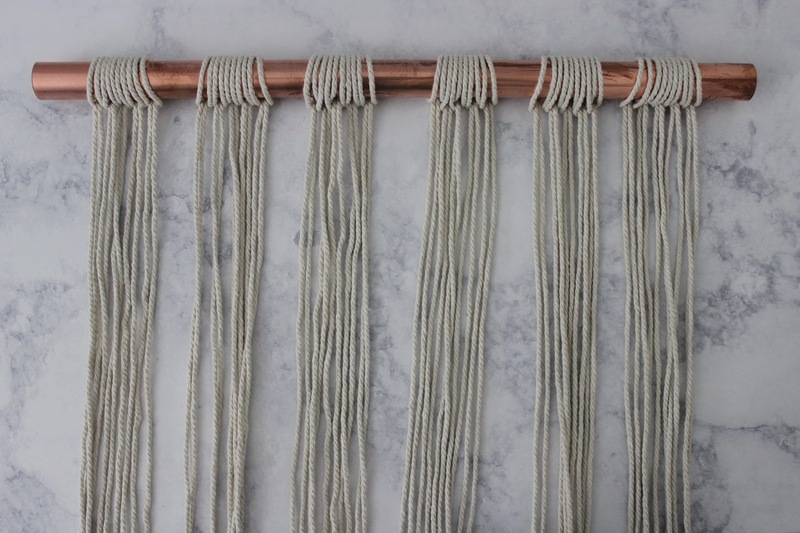 I definitely plan on making a bunch of these, probably one I can use as a faux headboard because I don’t have one. I’m currently traveling so don’t be surprised if my posts are random!